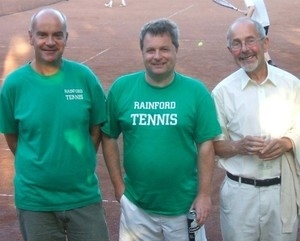 Rainford Tennis Club are currently enjoying one of the most successful seasons in their history. Since achieving Tennis Clubmark at the start of 2009, the Club have doubled their membership, have record numbers of juniors attending coaching and competitions and have delivered tennis to thousands of children in schools across St Helens. The Club, who are still the only outdoor venue in Merseyside to achieve Tennis Clubmark status, recently celebrated their successes with a special evening attended by local councillors Betty Lowe and Wally Ashcroft, as well as Lancashire Tennis President, Peter Williams. “The St Helens Schools Tennis Programme, which is organised by Haydock Schools Sports Partnership, with funding from Big Lottery , Tennis Foundation and the Schools Sport Coaching Programme has helped us attract more juniors to the Club than ever before” added tennis coach, Steve Vincent. Our picture shows Peter Williams (right) meeting Steve Vincent (left) and John Case from Rainford Tennis Club.